When home composting you are in control of the process and the methods used. You may choose to collect your kitchen waste in an old ice-cream container, plastic take-away container or to buy a kitchen caddy. ( There is some additional information at Composting methods ). We need to consider the type of caddy being used as this will influence the choice of bag or whether a bag is used. 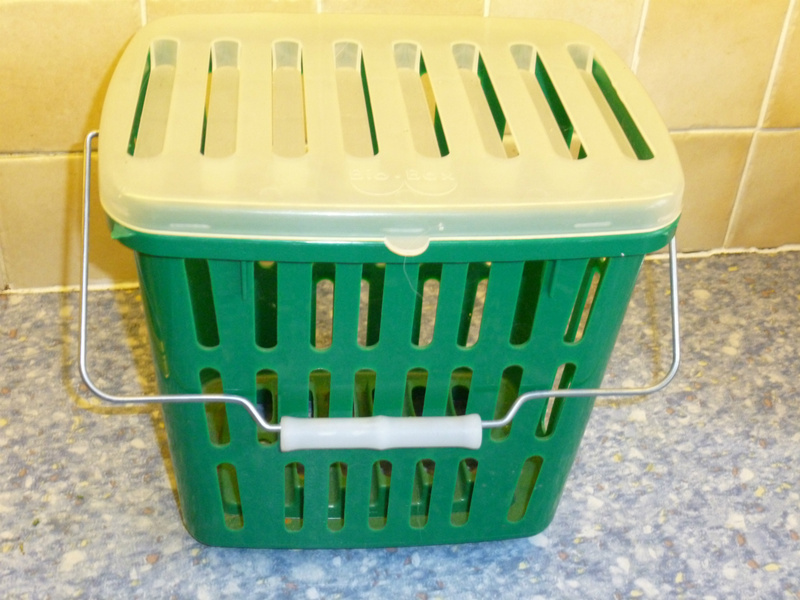 There are numerous low cost kitchen caddies available, as well as quite expensive “designer” and metal ones. The simplest plastic caddies have an airtight lid and solid sides; some have the addition of a filter while others have open ventilated sides. Whichever style you choose it is better to opt for a size of bin that will require emptying every day or two rather than a larger size that holds more waste and make be emptied less regularly with the result that the waste starts to decompose, produce leachate and smell while in the kitchen. Leaving the waste in the kitchen caddy for longer periods may also allow time for fruit flies to hatch. 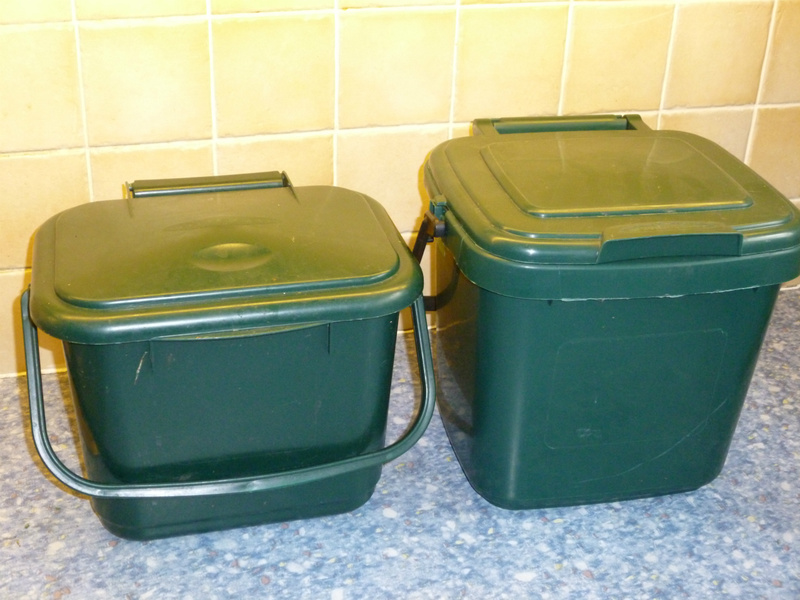 When home composting kitchen caddies with an airtight lid and solid sides can be used without the need for a compostable collection bag. The waste can simply be emptied directly into the compost bin or wormery and then washed by hand or by putting it in the dishwasher when it is next being run. This is more environmentally friendly than using a caddy liner. Those who use ventilated basket style kitchen caddies, which allow the food waste to lose some moisture by evaporation, will always need to use compostable bag liners. For this reason I do not favour this style of caddy when home composting. However if you are taking advantage of a Council kerbside collection system you will be required to follow their procedures and the ventilated caddy with a liner is increasingly becoming the method of choice. When transporting material by road journey weight is an issue especially if it is being weighed at the end of the journey. The weight loss by evaporation in a ventilated caddy can be as much as 30% in the few days it is waiting for collection. Evaporation and airflow through a ventilated caddy has additional advantage of reducing the likelihood of the material starting to decompose anaerobicaly and reduces the risk of unpleasant odours. In addition, the condensate that can accumulate at the bottom of traditional closed caddies is avoided. This system also offers the additional convenience to the householder in that the caddy will not need to be washed after each use. Containing the food waste in compostable bags also offers advantages across the collection, transport and composting systems and one council has estimated that the use of compostable bags for the food waste was twice as efficient as the next best food collection scheme, which did not use bags. Kraft paper bags are used by many to keep their caddies clean and to make it easier to dispose of the waste as the full paper bag can be lifted from the caddy and put in the compost bin. Of course this advantage is lost if the contents have to be shared amongst two or more bins or wormeries. Kraft paper bags are available in sizes to fit most kitchen caddies, whether they are in commercial or domestic kitchens, or can stand independently on the kitchen work surface. Although the bags have superior wet strength to assist in retaining moisture, the paper used is designed to break down within 112 days, so enabling composting or biodegradation when the waste is disposed of. During the process of degradation, the large molecules in the plastic bag are broken down into smaller molecules usually incorporating oxygen. This oxidative degradation, normally initiated by exposure to UV light or heat, results in the plastic becoming weak and brittle. These material normally take longer to break down into carbon dioxide, biomass and water than biodegradable products. The degradation process ends in biodegradable action when the degrading plastics have been broken down into molecules so small that they can be consumed by microorganisms. While bags classified, as Biodegradable will be degraded more quickly than degradable bags eventually they will still take much longer to decompose than the composting process so are of no value to composters. Indeed most manufactories do not specify the timescale. Compostable bags are those that can be decomposed by aerobic bacteria at a compost site until it cannot be distinguished from the other compostable material. This process should be completed at the same rate as the other compostable materials. Officially as the product of the decomposition of compostable plastic bags will contain inorganic compounds it is not classified as pure compost or humus. There are two main types of compostable bag based on polyethylenethat meet the European standard (EN13432) for composting. These should degrade at least 60% within 180 days. In most cases “compostable” bags have been designed not for home composting but so that they degrade during an industrial composting process which exceeds a minimum temperature of 55°C the Composting Association Standards for Composts. The plastic bags of choice for home composting are Starch or Biobased (Hydrodegradable) made using corn (maize), potatoes or wheat. These have a limited shelf life but if stored in cool, dark, dry conditions should have a shelf life of approximately 18 months. Provided the right gauge of bag is used for the type and volume of compostable material with which it is to be filled the likelihood of the bag splitting is now small due to improvements in the strength and degradability of compostable bags for household use. 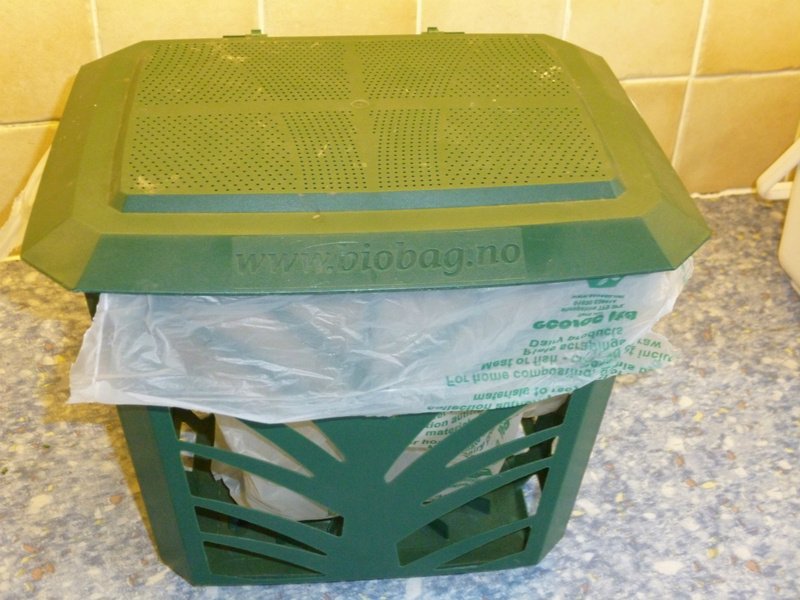 However, there are bags that are designed to meet the European home compost standards. These should completely degrade in 90 days in a compost bin that maintains a minimum temperature of 45°C. Some are claimed to degrade in as little as 10-45 days depending the composting system used. The bags carrying the home composting label have been tested at ambient temperatures (20 -30) for up to 26 weeks mimicing the temperatures in a home cold composting bin. Please note that in the results in your home composting bin may be different and the bags may not breakdown easily. A Garden Organic members experiment, reported in The Organic Way 217 Spring summer 2017, showed that "home compostable" compost caddy bags made from plant based film showed a high degree of varibility when home composted with only 26% completetly degraded after a year in the compost heap. It is unfortuately the case that if these bags are used in a cold system, you can expect to find them stuck on the prongs of your fork or the end of our compost aerator for some considerable time. No clear colleration was found between the type of compost heap or the heap temperature and degraration. A correctly operated hot composting system, where the temperature is maintained at 45C or above should be able to deal with the bags that are made to meet this standard. Compostable bags will decompose in a home hot composting system, indeed Hotbin (http://hotbincompostingblog.com/tag/compostable-bags/) found that at 60 C they broke down within 30 days. The bags are breathable bags and the the contents e.g. waste food may have composted before the bag is degraded. But there is still a problem when using them as the plastic bags reduces the airflow and oxygen available to the microorganism within the bag resulting in a risk the food being decomposed anaerobically until the bag itself has disintegrated. This takes about 10 days in a Hotbin. If a high proportion of the food waste, is added to the compost bin in such bags the anaerobic contents may create an impervious layer similar to that which would occur if a quantity of grass were added without mixing an adequate supply of “browns”. This will result in a cooling of the bin, anaerobic contents and the job of emptying and remixing the contents. 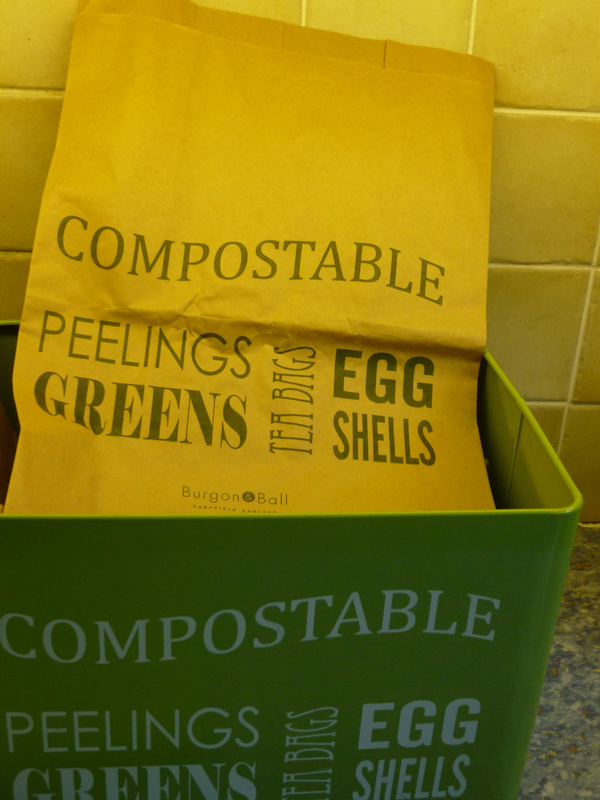 It is recommended in the Garden Organic Book of Compost (New Holland Publishers (UK) 2011 that the contents of the plastic liner are emptied into the bin and the now empty compostable bag is added separately.